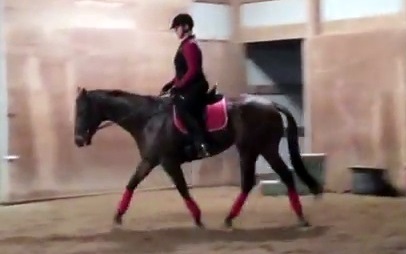 This is a better trot. I really appreciate Christy’s willingness to grab video for me in my lessons. It’s so helpful to see what I’m doing and what we look like. My reviews of the last couple nights’ work weren’t terribly encouraging. On the up side, during the spooking episodes, I could see that my lower leg didn’t move and my position remained solid, enabling me to stay firmly in the tack – which is why I wasn’t bothered by Derby’s antics. I was able to do a better job of capturing the forward energy tonight. However, there was a lot not to love. I am not holding the outside rein. I’m letting him steal rein length from me. I’m collapsing in my core. The result – we’re going around in a nose-pokey-outy hunter frame. This won’t cut it. What energy I manage to generate behind I lose out the front end. 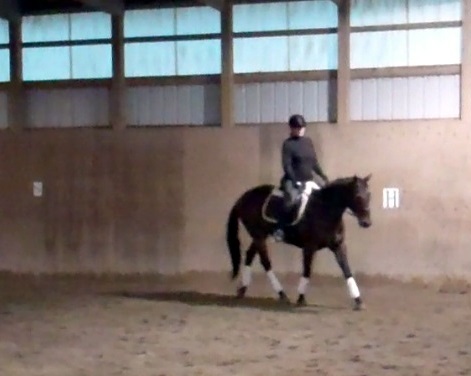 Later in the lesson, we took aim at another issue I have – I need to soften the inside rein rather than pull it. 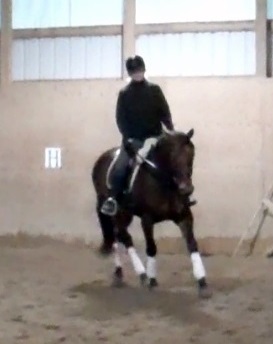 Christy had me make a point of giving the inside rein – and the second I did, Derby rounded. It was a good ride – the quality of the work improved, and I’m going into the weekend with some tools to use to keep encouraging Derby to work over his back – we need to build those muscles. Lessons start again on Monday! Well, I have some news. I’m going ahead with the surgery to free Derby’s entrapped epiglottis. It’s scheduled for Monday. He’ll stay overnight at the clinic, and come home the following day. After that we embark on a 2-3 week recovery period. His airway has to stay very quiet during this time. 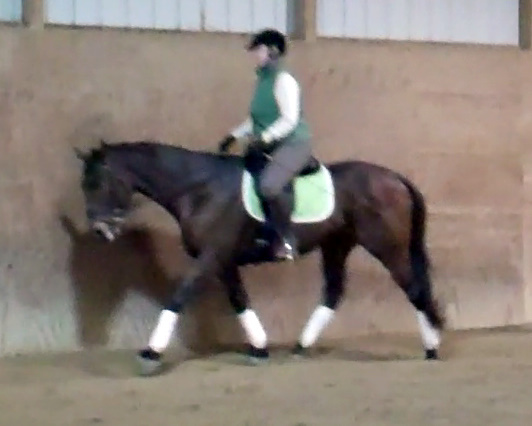 That obviously affects some of my plans, but still, I’m hoping to have him out at some schooling shows in May. To that end, we rode through some Intro tests tonight. I had forgotten them and the first pass through each was ugly. However, we quickly got our act together and put in some respectable rides, which was encouraging. 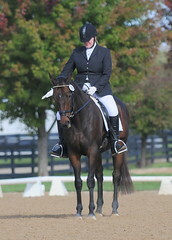 We spent some time on downward transitions, maintaining energy and roundness in the walk when coming down from the trot. I rode a couple that I believe were the best I’ve ever ridden, and I had some ‘Ah ha, that’s what it’s supposed to feel like’ moments. I had to start with good energy at the trot, and then ride very deliberately into the transition. Balancing forward and down is still hard for me. However, it’s the very beginnings of collection, in which you add energy, not take it away. So adding energy as you go into a downward transition is a crucial skill, and it’s one I really don’t have yet. Add it to the list. I have one more lesson and three more rides before the post-op hiatus. Boo. I really wish I could have had this done back in February! Oh well. This too shall pass! I’ve had some interesting rides recently – not great, but interesting and productive. 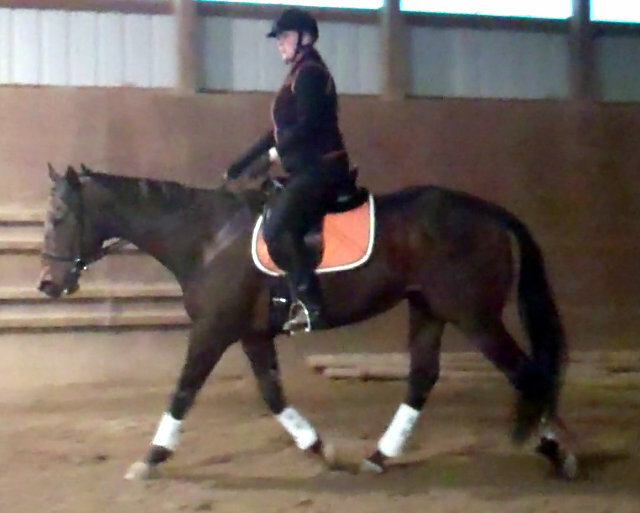 The good news is that while our canter work lacks grace, I’m growing more and more proficient in that gait. 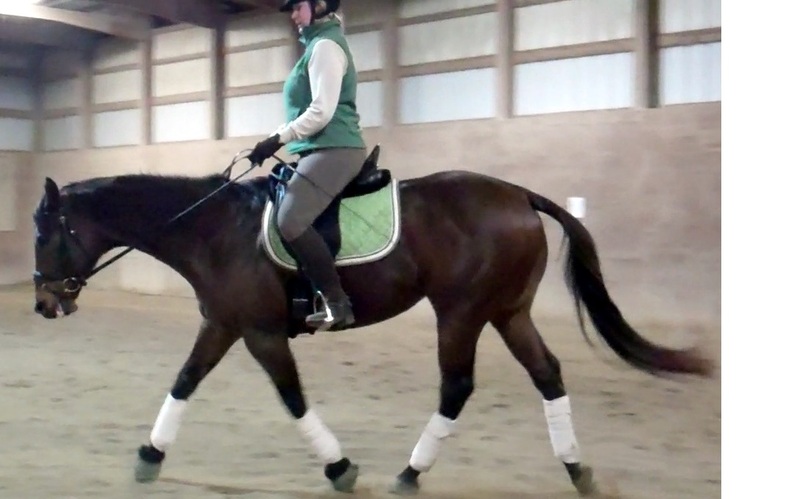 It’s comfortable, I no longer need to work myself into cantering, and I’m starting to actively manage the gait, asking for more a more forward canter, and correcting Derbs when he breaks to a trot before I ask for the downward transition. Getting the horse forward and into the bridle is still a work in progress. The key here is getting Derby in front of my leg. I know that I need to stay on this and not accept a sluggish response. Today I felt the canter petering out, and reached back and gave him a crack with the whip. He surged forward, I said “Good boy!” and stayed out of his mouth, letting him go on. We had kind of a crappy ride in my lesson yesterday – Derby was dull and almost rank – he felt very resistant and we had numerous discussions – about walking, about halting, about transitions. 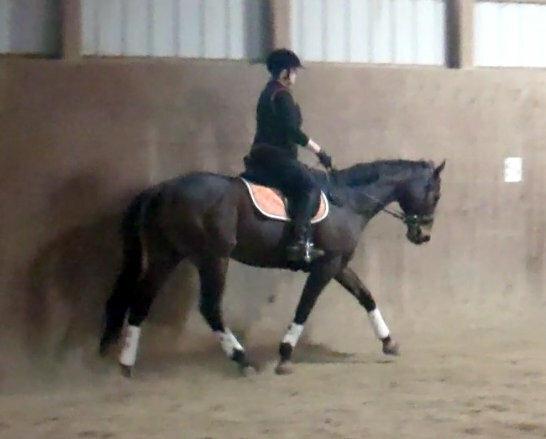 We abandoned work on transitions in favor of working on getting the horse forward. Christy had me reinforce my aids with whip and spurs and pretty soon, I had some good responsiveness. But, across the board, the ride wasn’t great. Derbs earned himself a couple days off. We have family coming over tomorrow and Friday. It’s going to be warm and sunny, and the paddocks are full of lovely squishy mud that I”m sure I’ll have to chisel off on Saturday. He’s earned it however. Good boy!